If you’re short on time, this comic provides a good cliff notes version of pretty much everything I’m about to say, even though I’m not affiliated with the person who made it. I’ll link it at the bottom, too, in case you want to read my thing first. I’ve linked to a documentary and a really good article about vaccines before, but today I want to focus on the topic a bit more thoroughly. Unsurprisingly, I was raised without vaccinations, being told that they are more harmful than helpful. He claimed that vaccines are linked with AIDs, cancer, SIDS, and of course autism, saying no country with autism is without vaccines. He even said that Jenner, who helped develop the smallpox vaccine, never vaccinated a member of his own family. Offhand, without even looking up sources, I know that those second two bullet points are no big deal. Those 35,000 reactions a year could be almost entirely redness and itching around the area in which the vaccine was given. My arm was sore for a day or two after several of the shots I’ve received. That’s a common reaction. The 198 dying from medical drugs is a really low number, when you remember that America has over 300 million people and most of them take drugs at some point in their lives. How many of that 198 are people overdosing on purpose to commit suicide or human error such as a new nurse giving too high of a dose or allergic reactions? We don’t know from the video I watched, I’m sure. Even if that number is exactly what that video made it out to be, and accurate, that’s still an extremely low risk compared to the possible help drugs can give. The other three specific claims I’ve listed, about how often children are damaged or die from vaccines and that Jenner did not vaccinate his family, will require a little bit of research. It only takes a few minutes to find a source that says, “Undaunted, Jenner experimented on several other children, including his own 11-month-old son.” Even this anti-vaccination website admits Jenner did vaccinate his own son, although it claims the boy experienced ill-effects and the vaccine caused tuberculosis in him and the farmer’s son who was another early smallpox vaccine recipient. Another part of that chiropractor’s talk I remember, or possibly a different talk on the same subject, was about showing school officials why it is illogical to require vaccines for a child to attend school. This stuck with me because it made so much sense, and if you lack the understanding of vaccines and herd immunity I did, you can see why. The following paragraph is all paraphrased, but contains the idea of what was said. Teachers will tell you, he said, that they want your non-vaccinated child to stay home for their own safety. Ask, “If all of the other kids are vaccinated, and the vaccinations work, how will my child get sick from them?” The teacher will admit that it is for the safety of the other children. Ask, “If they are all vaccinated, and the vaccinations work, then what are you worried about?” See, if the vaccinations do grant immunity, how can those who are vaccinations get sick from my child? How can they get sick and give that illness to my child? There are probably many ways to poke holes in this argument, but I’m going to focus on the two things I learned that changed my mind. First, vaccines are not magic. They do not, even in theory, make it 100% impossible for the disease in question to enter someone’s body. Second, humans who cannot be vaccinated benefit from herd immunity. Because vaccines are not magic, a person who has been vaccinated against a disease could still become infectious through another exposure to that disease, but not show symptoms. Immunity just means the immune system can fight a disease when it encounters that attack; it doesn’t mean it won’t encounter it at all. Therefore, a child without immunity (i.e., without vaccination) could still get sick from a child who has the vaccination, but maybe has an uncle who couldn’t get the vaccines – the child became infectious through his uncle, but didn’t get sick himself. It is also possible for a person who is vaccinated to succumb to an illness if surrounded by enough other people who have it – and a classroom is an ideal setting for this. If 29 children in a room have chicken pox, vaccination is not enough to protect the 30th child. Cases like that hypothetical uncle are very real, and are exactly why parents refusing to vaccinate their children are seen as a public health risk, not just a private one. This is where herd immunity kicks in: the more people around a person who are vaccinated, the less likely it is that a non-vaccinated person ever encounters that disease. Herd immunity is how we have eradicated whole illnesses: not by vaccinating everyone, but by vaccinating enough people that no one who was not protected encountered the disease. This is also why areas that have high rates of people putting off or neglecting entirely vaccinations are seeing the return of whooping cough and measles. Learning these things helped prompt me to go get the vaccines I was denied as a child (that, and an outbreak of mumps in my area). If you would like to learn more about why to choose to vaccinate, here’s a helpful link that is honest about the risks and why we know they are minimal. If you’ve ever seen those “courts confirm MMR and autism are linked” articles, and even if you haven’t, here’s a good article about why such arguments are not just wrong, but wrong-headed. This is another link to the comic on vaccinations I mentioned at the beginning, for those who didn’t click on it the first time. 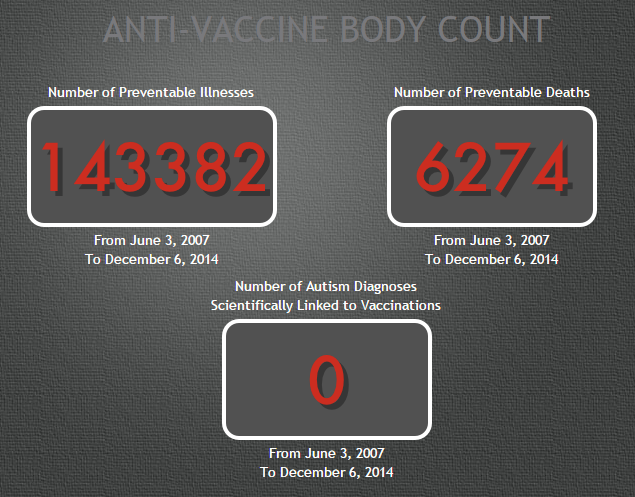 How high do these numbers have to rise before this anti-vaccine madness stops? The cases of autism caused by vaccinations can’t get any lower! I think that, for the most part, this article is pretty well done. It does sound to me that the chiropractor was gish-galloping on the anti-vaccine stuff. In all my time studying this issue as part of physiology and microbiology, I’ve literally never heard the claim that vaccines cause that much harm or are directly responsible for that many deaths. Here’s the thing: even if that is true, diseases that vaccines prevent are worse by several orders of magnitude, and even if you survive diphtheria, polio, measles, mumps, etc., you can have lifelong crippling deformities and damage that outstrips any risk from vaccines. I think you did a relatively fine job here, though. Of course, you’re going to get people who reject herd immunity and the like, but that’s often because they don’t actually understand, physiologically how vaccines and the immune system works. Thank you! I am a little bit concerned that the paragraph that starts “Because vaccines are not magic” could give the impression that I think it is possible to be a carrier of a disease through a vaccine. Not only do I not think that, but my understanding is that it is impossible, at least for modern vaccinations. I’m considering writing another post on this topic to address that. The more people addressing those who are misinformed, the better, right? Unless, of course, the addressers are as misinformed as the addressees.